State-of-the-art technology in design software and manufacturing allow for more complex designs to be accomplished than could be with conventional framing. Trusses can be designed to span longer distances, thereby eliminating the need for interior bearing walls. We design and manufacture 2x4 floor trusses for residential and commercial floor systems. Floor trusses allow for greater clear spans than any other wood system. By using Roof Trusses instead of conventional framing, there is a significant savings in the amount of material needed to do the job. Labor costs are also reduced, as a properly designed system requires much less time to complete than conventional framing. Because trusses can be designed to span long distances, the need for interior bearing walls and footings can be eliminated in most cases. 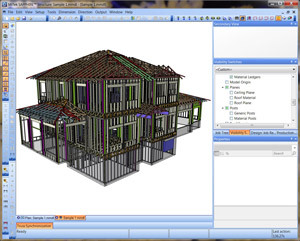 State-of-the-art technology in the design software and manufacturing techniques also allow for more complex designs to be accomplished than could be with conventional framing.